This little project was so enjoyable! I started it a few weeks after the wedding and it was so nice to have the time to do something crafty instead of pinteresting, planning, and responding to many, many emails. One of my childhood friends, who has since had her baby, came all the way from California to the wedding and was such a trooper all weekend despite being very, very pregnant! 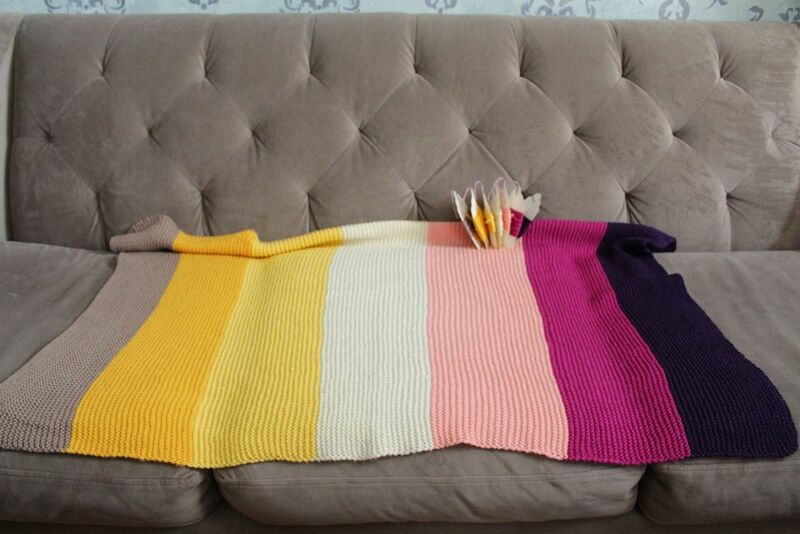 You can find the pattern from The Purl Bee, a beautiful blog from a knitting store here in NYC. I used 7 different colored skeins of Superwash Merino Wool. The "superwash" means you can machine wash it, but, as is the rule for all wool, do not dry in the dryer! Otherwise, it will shrink and the wool fibers will ruined (insert sad-face). Josh very patiently waited for me to choose the different colors. Can you tell that she had a girl? If you are indecisive, the pattern includes some gorgeous color combination suggestions. The pattern called for US #7 needles, but I ended up using US #8 because... well, because I wasn't really paying attention to the pattern and forgot to buy the needles when I bought the yarn and I had US #8 at home. After consulting my knitting guru, Merav, and we decided it would be okay since I'm a tight knitter (translation: a tense person who takes their stress out on their knitting). The difference between a #7 and an #8 is just half a millimeter, no biggie, right? In the end, the blanket came out beautifully, but I'm a 20/20 hindsight perfectionist and I kind of wished I had just sucked it up and gone back and bought the correct needles. Why? The blanket just felt "looser" than I wanted it to, especially for a little tiny baby. I made sure to include the excess yarn from each color, just in case anything needed mending in the future. Plus, it was a great way to use some of the many tags left over from the wedding! I had so much fun knitting such cute colors together and it was really nice to be able to give my friend something that really meant a lot to me to make. Every step was wonderful, even packing it up and taking it to the post office. A lot of love went into the blanket and I hope the baby loves it as much as I do!